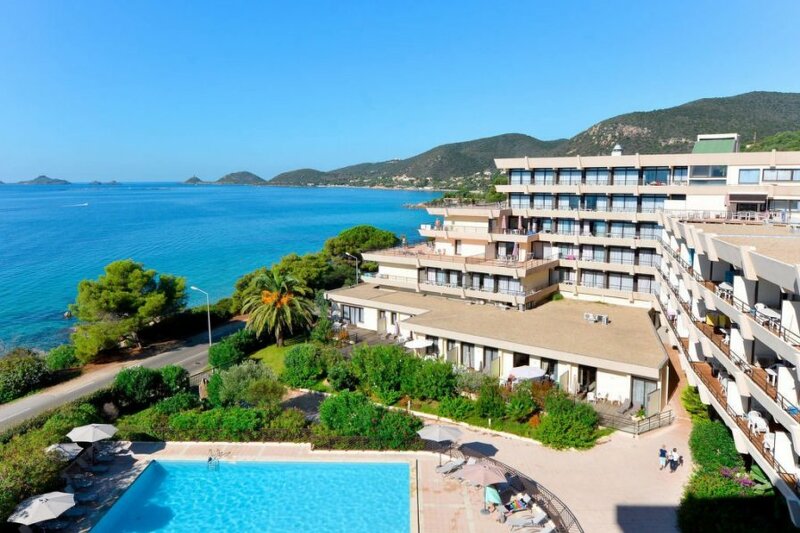 This 1 bedroom apartment with swimming pool is located in Ajaccio and sleeps 2 people. It has WiFi, air conditioning and garage. The apartment is within walking distance of a beach. Apartment, 2 people, 1 room/s, 1 bathroom/s, approximately 20 m², 1 floor/s. Feature: Property in a residence (max 6 floor(s), 121 units in total). Holiday resort tax. Linen/towels available (beds are ready-made upon arrival). Change of bed linen/​towels 1 x included for stays of 14 days and more. Deposit € 250 (Visacard, Mastercard, American Express). Extra bed € 5 per day (on request). Cot/​High chair each € 5 per day or € 21 per week (on request). Pet 1 pet allowed, € 9 per day (please advise prior to arrival; additional animals on request only). Situation: suburbian area, sea view, view of Iles Sanguinaires. Access/parking: parking outside the holiday complex approximately 100 m; reserved car park in underground garage (payment, depending on availability). Pool (shared use): 15.0 x 10.0 m, 01/05/19-19/10/19, depending on the weather, secured by a fence, heated, children's pool. Pool area: tiled, sun loungers (included / depending on availability), sunshades (included / depending on availability). Infrastructure: reception service several hours only, bakery service; washing machine (shared use, payment); dryer for shared use (payment); lift, common room. Snack bar (approximately June to September); breakfast: payment. The agent describes this apartment as an ideal holiday rental for the summer holidays. For younger guests there is some vibrant nightlife not too far away. It is also good value for money. This apartment is located in Ajaccio. The nearest airport is only 22km away. It is set in a convenient location, just 0 metres away from a beach and 7km away from the city center. The apartment has free wireless internet. The apartment is adequately equipped: it has air conditioning and a washing machine. The property has a sauna.